No sophomore slump for TRNSMT then. The city centre festival has been one of the chief beneficiaries of the weather – the unlikeliest of Scottish summers – going down a storm at Glasgow Green. Much has been said about the lack of diversity in the festival's programming and it's fair comment; something perhaps to consider for the future. The line-up, broadly speaking, has an algorithmic feel; it is the opposite of adventurous, perhaps epitomised by tonight's headliners, who're making their TRNSMT debut, but topped the bill at the former T in the Park on multiple occasions. This reflective conversation has a place. Several pints deep, watching a man dance on top of a giant bin while tens of thousands of people belt out 'Mr Brightside' is not that place. TRNSMT is a wonderful, wonderful day out. First up, a future headliner. Possibly. 'If you don't like chubby guys playing sad songs you've come to the wrong place', jokes Lewis Capaldi (★★★☆☆), who gets a huge response from the crowd early in the day. On 'Fade' his voice is a tender plea one moment, an amplified growl the next and the material is melodic and memorable – recalling James Morrison's radio friendly heyday 10 years ago. All Capaldi is really lacking is a change of dynamic in his set, which is a little one paced. But he owns his moment, and we will surely be seeing and hearing a lot more from him. It's a tricky slot early on the King Tut's stage for Juanita Stein (★★☆☆☆).There's an issue with a guitar amp, the crowd is thin, but she doesn't rally, departing having played for just over 20 minutes. It's a pity to say the least, because recent album America is excellent. Over on the mainstage, the note perfect Jessie Ware (★★★★☆) is one of the day's highlights. The expansive Glasshouse is her best album yet and the songs soar in a live environment, with the shuffle of 'Your Domino' and the soulful 'Alone' as the standout moments. 'It's been 6 years,' says Friendly Fires' (★★★★☆) Ed McFarlane, as the band launch into 'Lovesick' from their self-titled debut. They're in the mood to make up for lost time, and while there's a glimpse of new material, the set is stacked with hits. 'Paris' is still glorious and the drawn out ending of 'Kiss of Life' is a triumph, with two timely blasts from the main stage confetti cannons adding to the carnival atmosphere. Over at the King Tut's stage, Jane Weaver (★★★★☆) plays to a sparse crowd, but those present are in awe of her sparkling technicolour pop, with its krautrock grooves and psychedelic elements. Weaver's problem is that her set intersects with local heroes Franz Ferdinand (★★★★☆), still one of the best live bands in the business. Alex Kapranos is on top form (when is he not? ), parading around the stage, commanding the assembled masses to sit down, mixing up his lyrics mischievously. New members Julian Corrie and Dino Bardot both look and sound the part; 'Take Me Out', 'Michael' and the closing 'This Fire' retain their anthemic art-pop charm, while the cuts from Always Ascending stand up well, particularly 'Feel The Love Go'. CHVRCHES (★★★☆☆) are the penultimate act on the main stage and at times their performance is irresistible. Now with added Jonny Scott on live drums, the show has extra ballast, particularly notable on the highlight 'The Mother We Share'. Lauren Mayberry is a commanding stage presence. On the flipside, it seems that it's not just the critics who can't get into new album Love Is Dead; the new material just doesn't get the response that the likes of 'Recover' and 'Bury It' do. A change of direction is to be applauded but in shooting for the charts and super stardom, CHVRCHES have lost some of their essence. So to The Killers (★★★★☆). We've been here before – but there's a reason why. 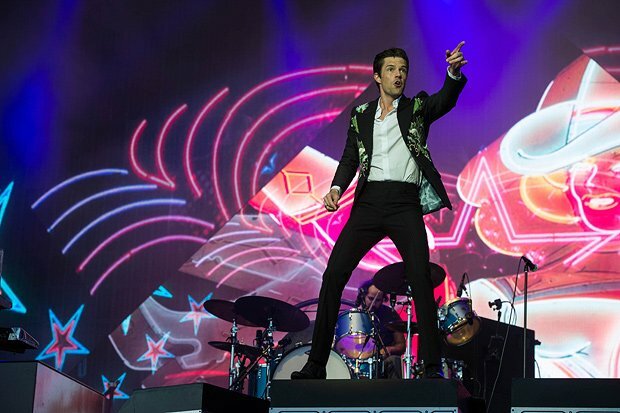 Brandon Flowers and band are the perfect festival headliner. The people get exactly what they want; the opening salvo of 'The Man', 'Somebody Told Me' and 'Spaceman' sets the tone. You could play bingo with what follows. Audience member on stage? Check – as a young man takes over on drums for Sam's Town favourite 'For Reasons Unknown'. Cover versions? Check, times two. The Waterboys' classic 'The Whole of the Moon' gets an airing, as does 'Side' by Travis. The set is closed with a triple header of 'Read My Mind', 'All These Things That I've Done', and 'When You Were Young', with 'Human' and – inevitably – 'Mr Brightside' rounding off the encore. It's a spectacular finale that sends the crowd into what resembles a religious frenzy – and in those moments you can't fail to be taken in by it all.